Tokyo (東京, literally "Eastern capital") is the seat of the Japanese government and the Imperial Palace, the home of the Japanese Imperial Family, and the de facto capital of Japan. Tokyo is considered one of the world's major global cities and a megacity. Prior to 1943, Tokyo was the name of both one of the 47 prefectures of Japan, Tokyo-fu, and the populous city of Tokyo in the eastern half of the prefecture. In 1943 the city and prefecture were merged into a unique prefectural level government entity, known as Tōkyō-to 東京都 or "Tokyo Metropolis". This administrative region includes the twenty-three "special wards" of the former city, many suburban cities in the western half of the prefecture, and two chains of islands extending south into the Pacific Ocean. 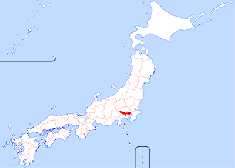 About 12 million people, 10 percent of Japan's population, live within Tōkyō-to's prefectural boundaries. Tokyo has the largest metropolitan economy in the world, despite falling in ranks in recent years due to economic stagnation and currency fluctuations: its nominal GDP is around US$1.315 trillion. In April 1995, due to excessively strong yen (79/dollar), greater Tokyo's GDP was valued at $1.9 trillion, then ranking fourth compared to nations in the world (after Germany and US) and larger than the 1995 nominal GDP of South Korea, China, and Taiwan combined, 28% of the entire nominal GDP of USA ($6.7 trillion then), and over 6% of world GDP at the time. About 35 million people live in the Greater Tokyo Area which encompasses Tōkyō-to and surrounding prefectures, making it the world's most populous metropolitan area. Because of its huge population and wealth, many world records are or were held here, including the most expensive real estate ever ($1.5 million/sq meter in 1990), the most expensive city for over a decade running, and the most passengers served by its train system. Tokyo is the national center of performing arts as well. There are many theatres in the city in which traditional forms of Japanese drama (like noh and kabuki) as well as modern dramas. Symphony orchestras and other musical organizations perform Western and traditional music. Tokyo also plays host to music like Japanese rock, J-pop, and Visual Kei. This page was last modified on 26 April 2007, at 00:24.